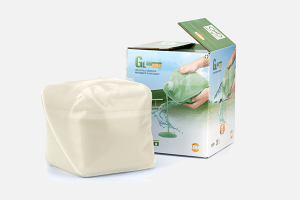 Grogreen Gel Calciphos is a stress releaving drip irrigation/foliar product for the most critical stages of plant development such as tuber initiation, flowering, root initiation, fruit setting, fruit growth, etc. It is a premium foliar feed combining Phosphorous with high levels of soluble Calcium, Magnesium, Boron and Zinc through our Gel-technology. It is used for crop–specific drip irrigation/foliar nutrition to eliminate deficiencies of fruit, vegetables and other specialty crops. Calciphos stimulates tuber initiation, root development, strengthens cell walls and improves fruit quality. 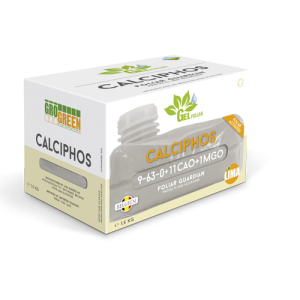 Calciphos benefits: Highly concentrated, low pH, fully soluble and unique composition. Calciphos can be used through the entire growth cycle, but is mainly beneficial in periods of high Phosphorous and Calcium demand. Therefore it is especially used in periods of root development, flowering, fruit formation and maturation. General application of 2,5-3 kg/ha day. It is recommended to use the stock solution within 2-3 days. After injecting the fertilizer into the system, continue to irrigate with water to flush the system. General application 2-5 kg/ha not exceeding a concentration of 2%.